Though my semester was really pretty crazy, I did manage to finish a couple of other projects either in snatches of borrowed time or in mid-December, once my papers were all in. 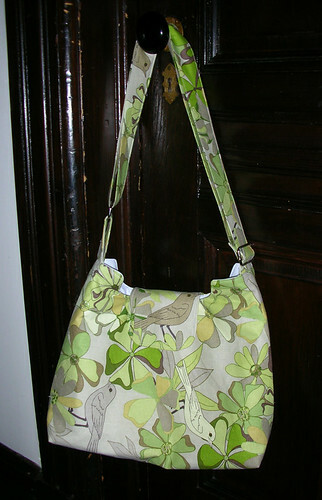 This bag is altered in a couple of ways. 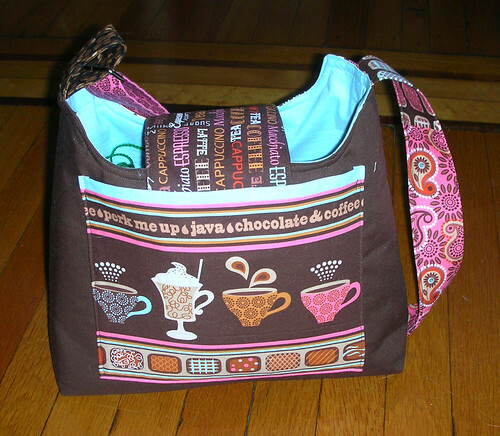 One side of the bag is a simple piece of Kona Chocolate, with a large print on it as an exterior pocket. The magnetic snap attaches inside the pocket, which seemed like a good idea at the time, but … well, I probably wouldn’t do it again. 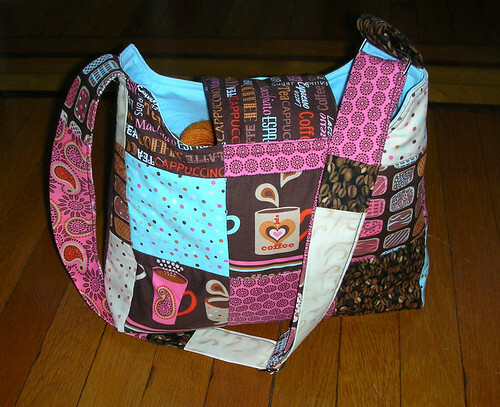 The other side is a patchwork of the various different fabrics in the Perk Me Up collection. One problem I had with my first Mabel bag is that the strap slides a lot. 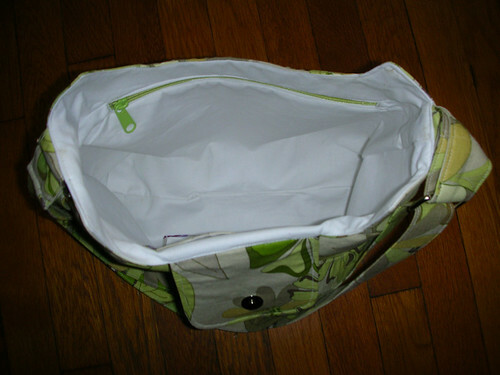 For this bag I made two changes to help it stay in place. 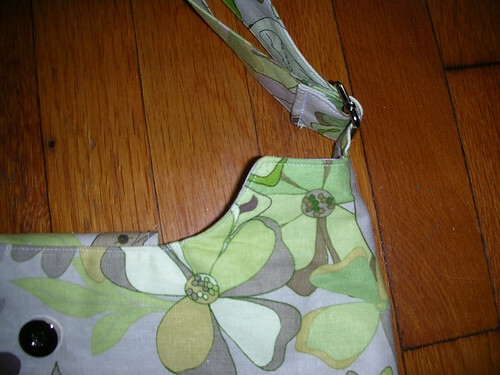 I made it scrappy, with seams that add a little bit of body to the strap every few inches, and I made it just a smidge wider than the pattern called for. 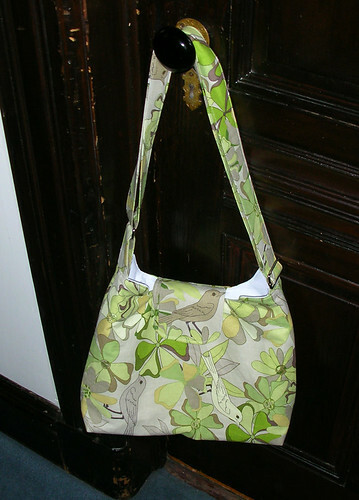 I really enjoyed making this pattern for a second time: it makes for a very smart bag, and I think I managed a couple of the details like the snap and the bag’s strap a little better this time than I did last time. 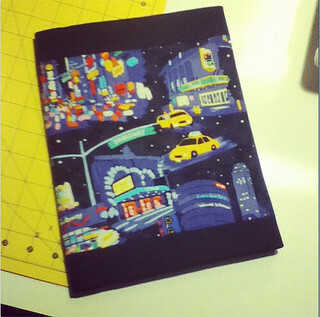 It was a lot of fun to revisit the pattern. 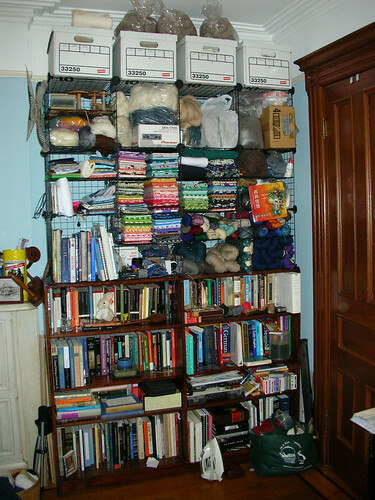 I just re-organized quite a bit so that all my crafting materials are in one room, and my desk and schoolwork are in another: having the sewing machine next to my computer was too good for procrastination. 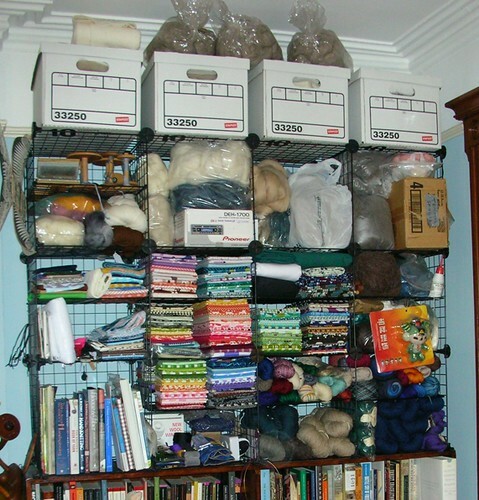 All of my fabric, fiber and yarn in one place. There was some serious tetris-like packing going on while I organized this, and I have a sinking feeling that it’s going to be like packing a suitcase for a trip: on day one, everything fits, but by day three, you can’t shove it all back in no matter how hard you try. 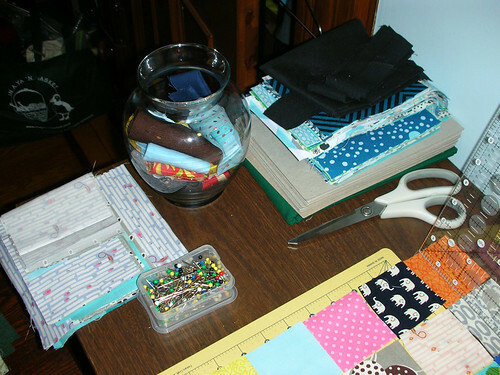 So far, though, it’s been great incentive to use what I have and work from stash, because I simply don’t have enough space for more fabric to join me. The bookshelf below actually holds a lot of books that ought to be in my study, but they fit here, so I have to get up and go get them, if I suddenly need something on Troilus and Criseyde, or on how to date manuscripts, or late medieval literacy rates. The top right shelf is history/biography that’s not related to school: I call it the “shelf of depressing” because it’s all things like Bury My Heart At Wounded Knee, and a biography of Ernest Shackleton, and 1491, and so on. Interesting stuff, but a lot of lying, betrayal and death, none of which is fictional. 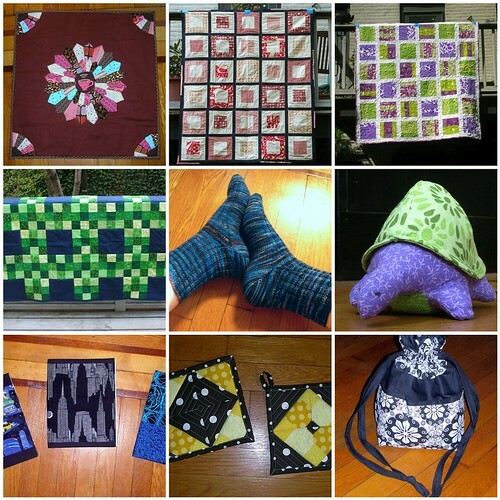 The basic layout is: top row fiber, second row mostly fabric (but some fiber on the right), bottom row mostly knitting stuff (but fabric & books on the left). 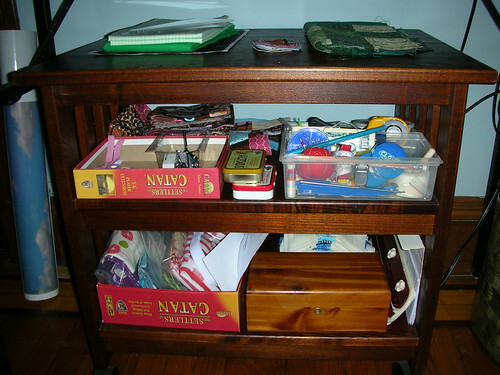 The cart’s organization is still something of a work-in-progress itself, but it’s working well so far. The top left is a box that holds my rotary cutters and scissors and sewing machine feet, as well as any small random things that I don’t want to have to get up to put away right away. 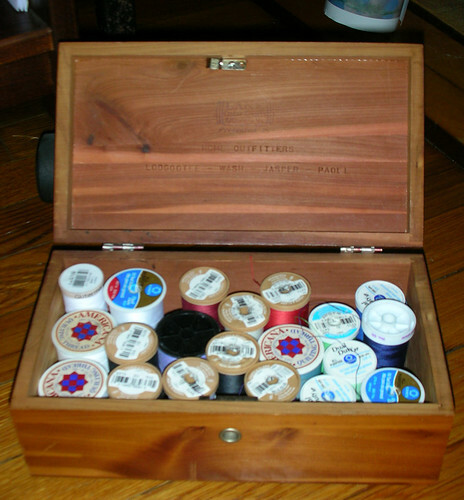 The top left is my sewing kit, with chalk pencils, velcro, binding tape, needles, pins, a pincushion, etc. 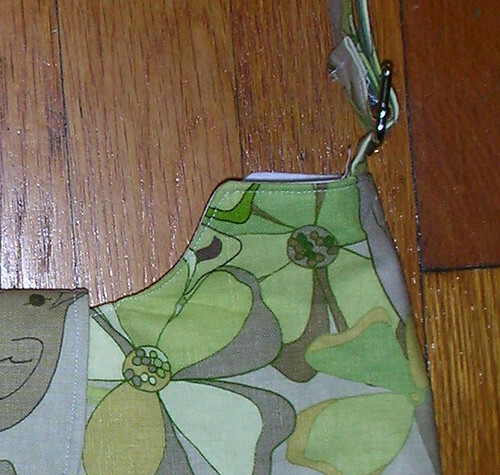 Behind them is a work-in-progress: my second Mabel bag, which is waiting on the arrival of more fusible interfacing. Some of these are spools I’ve had for years (from well before I knew how to pick thread) and I’m planning on gradually replacing my thread with better quality as it runs out, but for now, I’m using what I have. The top of the tv cart is where I lay out works-in-progress. 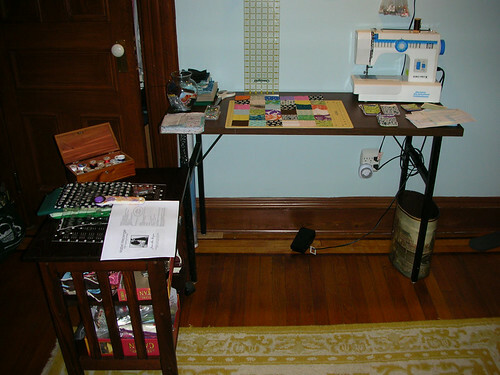 The tabletop I’m using as my bench is only about 18″x36″, so the extra space is handy. 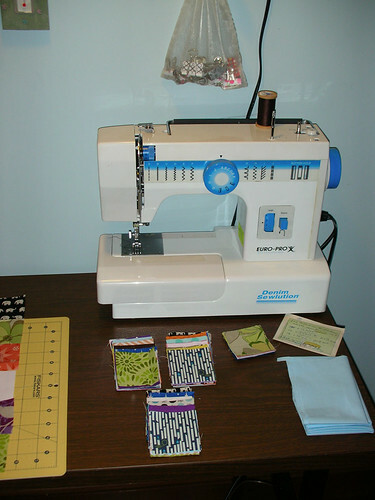 The right is where the sewing machine lives. 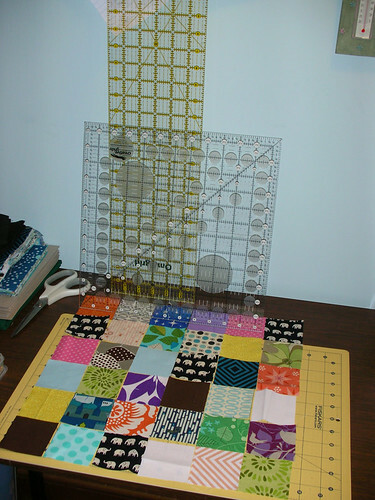 I move it to the back when I’m cutting, or line it up along the edge of the table. It’s not perfect, but it works! 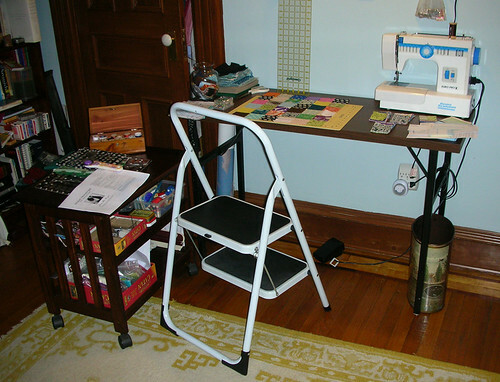 Overall, I’m pretty happy with it: it makes a distinct space where I can sew and quilt, which doesn’t overlap with my desk at all. I do have to be careful, though — if I leave the tv cart out, I can’t get into my closet! Gotta love living in NYC. 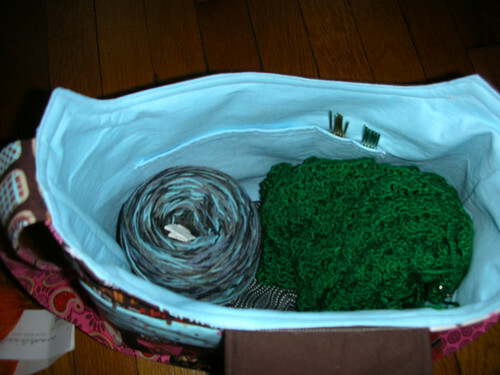 PS: I’m still de-stashing fabric and a little bit of spinning fiber. 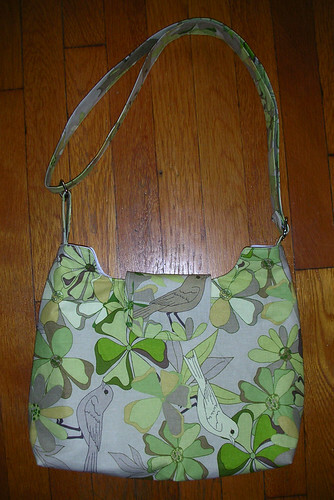 Author AlisaPosted on August 3, 2012 August 3, 2012 Categories SewingTags bags, finished!, mistakes, patterns, test projects7 Comments on Mabel Messenger Bag: Done!